Saville Stainless serves the catering sector with high-performance, hygienic sink units and equipment. We lead the industry in basins, taps and integrated units specifically designed for food preparation areas. 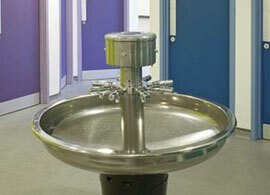 A wide range of equipment, from small hand rinse basins to industrial washing troughs. Bespoke units can be supplied, including preparation tables, worktops and hands-free washing units. We are able to supply standard pressed bowls or fabricated, specific-sized bowls according to requirements. The majority of units are produced using high-quality, 1.5mm thick, 304-grade stainless steel. Got a specific enquiry that we can help you with? Then Chat online with a one of our experienced staff. For hospital and industrial environments, we produce hard-wearing, versatile, stainless steel tables, work benches and bespoke units for any application. Complementing our stainless steel basins and sinks, our taps and spouts are easy to fit and operate, with a sleek finish. As a space-saving alternative to washbasins, our stainless steel wash fountains can be operated electronically or by hand or foot, combining quality with versatility. Practical, cost-effective and hygienic: our drinking fountains are convenient fixtures for any public space, with all the quality and durability of 304-grade stainless steel.